"This book is 320 pages thick. For the price, it's a terrific bargain. There are over 500 sketches featured from artists all around the globe. The styles are incredibly varied, ranging from pencil sketches to watercolour paintings. Each artist has a personal style, and each sketch has a story to tell. Some of the artists are so good they should publish their own books. Gerard Michel is one of them." 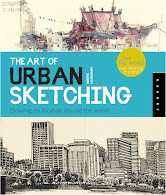 Read the full book review by Singapore artist Parka.